Reached via a two and half mile hike from Bear Lake lies Marigold Ponds. 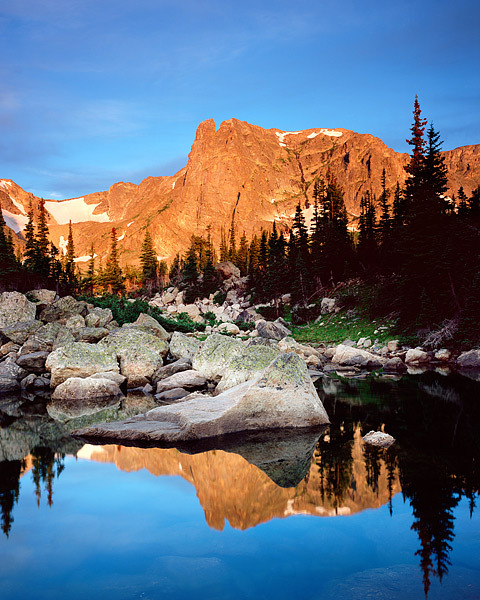 These small ponds rest just below Two Rivers Lake in Rocky Mountain National Park. Notchtop Mountain is reflected in one of the small alpine tarns. Clouds skirt over Notchtop Mountain as the first light of the day hits the majestic Colorado peak. Photo © copyright by Thomas Mangan.